On my first day in Hong Kong, I arrived at about 6:00AM. 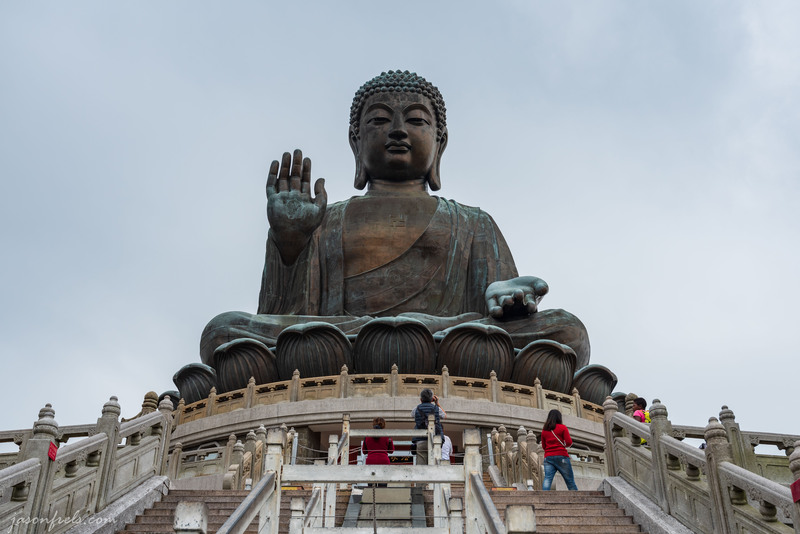 I couldn’t check in to the hotel until 3:00 PM, so I checked my bags at the airport and caught a bus to Tung Chung to take the cable cars up to the Big Buddha to do some site seeing and a little hiking. 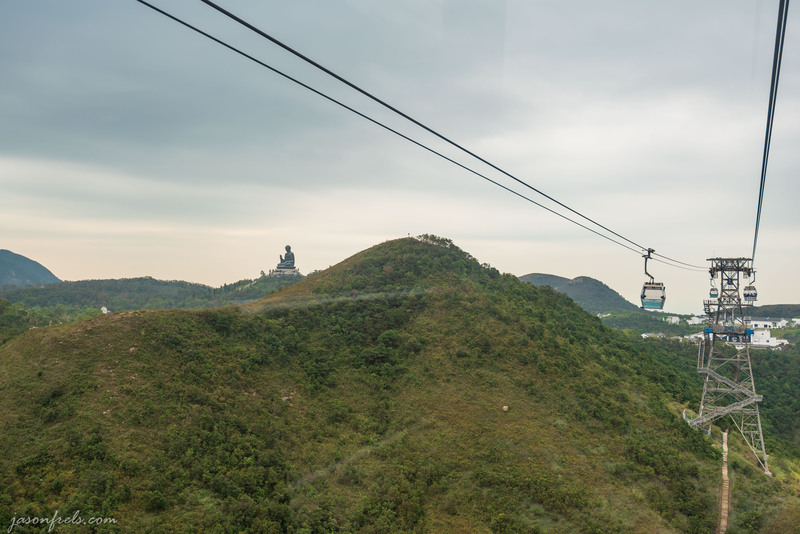 From the cable car, you slowly get a better look at the statue as you approach the top. I took this photo from in the cable car, so there are some reflections in the window. 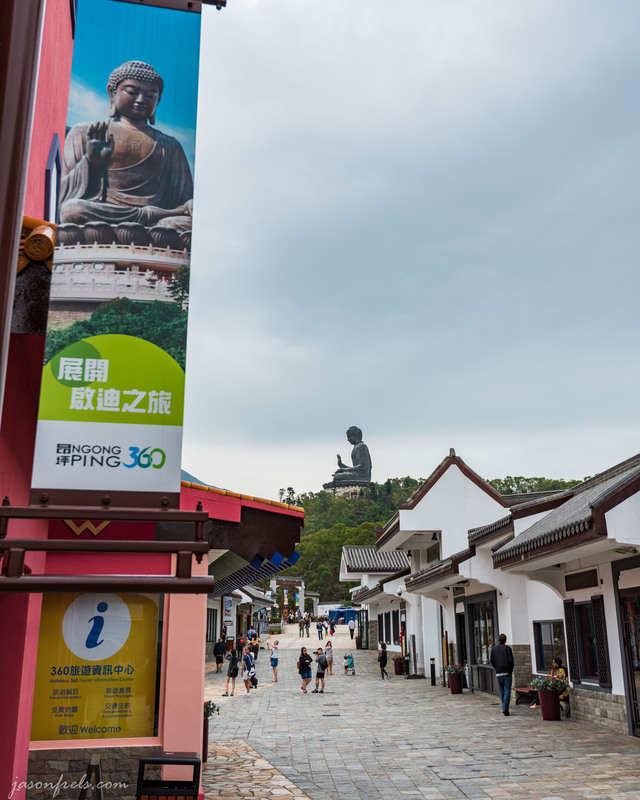 There is a touristy little shopping area at the cable car station that you walk through to get to the Big Buddha. There are a lot of dogs that apparently live around here as well as some cows. They seem to be well-fed and comfortable laying around and aren’t bothered by everyone walking around them. The below picture is looking up from the bottom. 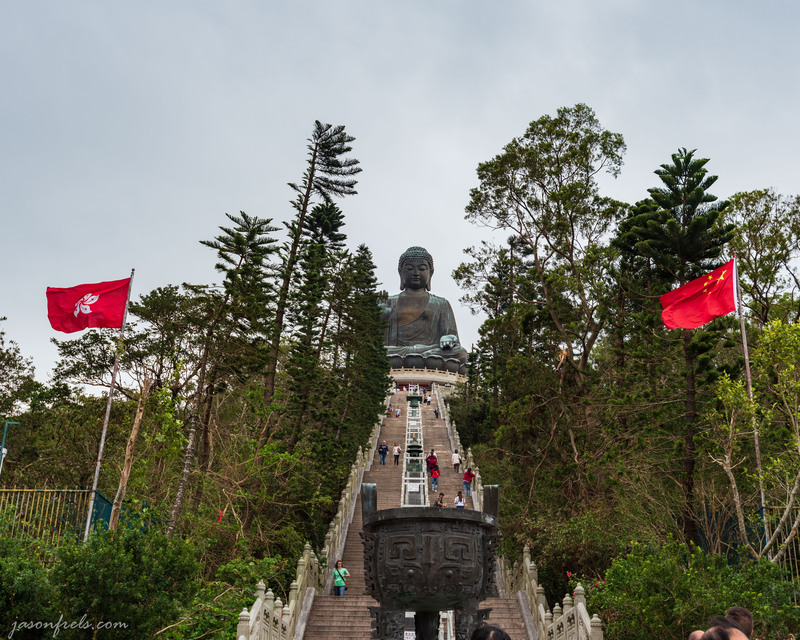 I like having the flags in the foreground on either side of the stairs; Hong Kong on left, China on right. As you can see, it was a very overcast day and the sky was bright gray. This is the second time I have been to this place and it was very cloudy both times for me. Below are a few picture near the top. 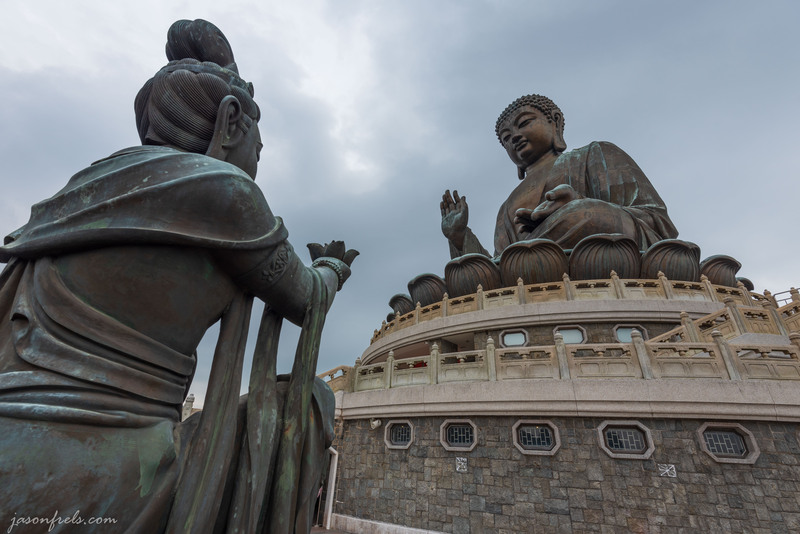 I tried to get behind one of the smaller statues in the following photo to get them both in the photo. This is a very wide angle (16mm) shot, which tends to compress the background quite a bit. The gray clouds aren’t really a good background and it is hard to get much color out of these pictures. I considered making some of them black and white. There are several hiking trails in the area, I followed one down to an area called the wisdom path. 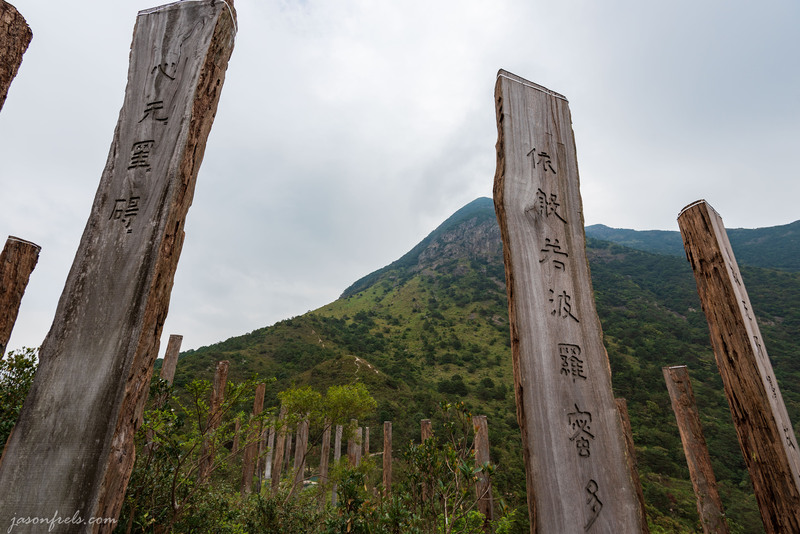 There are several large vertical wood pillars around a path. 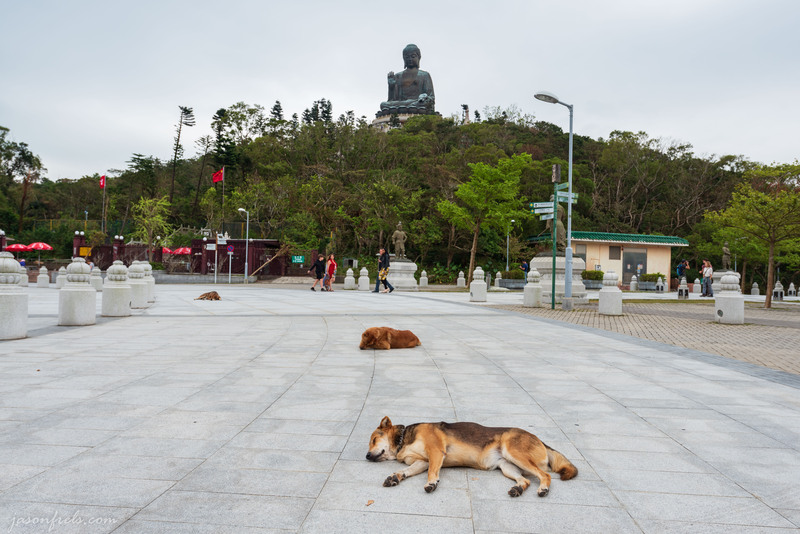 From here, you can hike trails all over Lantau Island. I hiked around for a bit and then made my way back to the tram station. Hopefully, better skies for tomorrow.